Shipping is paid by the customer. We offer USPS Priority Mail, FedEx 2 day, and overnight shipping. Orders over $250 receive Free Shipping! How large should my image be? The higher the resolution, the better, especially if you want to have a large poster printed as well. At least 1500x2000 pixels (a 3 MegaPixel image) is helpful for the highest quality. To check the resolution, just right click on the photo, select Properties, and under dimensions, you will see the resolution listed. Can I use a Black & White image? Generally a color image will be preferable, although Black & White images may be fine in some situations. For example, movie posters would lend themselves better to B&W than a cereal box style would. How can I send you multiple pictures when there are multiple people in the Nouncement? In this case, please email us, and we'll walk you through the best process for your situation. 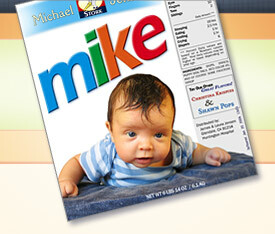 Do you create a whole cereal box or magazine for those styles? No. The "Magazine" style is similar to just the cover of a magazine, and the "Cereal Box" style is similar to the front and "nutrition facts" sides of a cereal box, flattened out. All of our designs are flat 5" wide cards that are suitable for sending in provided white envelopes. They can also be printed as larger posters. How much is the postage for each Nouncement? Each Nouncement card only requires a single stamp to mail. Do you provide envelopes also? Yes, we send an appropriate white envelope for each card. The movie poster style envelopes are slightly longer than the other formats. Do you send the cards out to an outside printer or do you print the cards in-house? We get the cards professionally printed at a nearby print shop, on glossy 12pt card stock. They feel like a professional card, and not like something that would come out of your home ink jet printer on thinner photo paper.